To encourage and co-ordinate the study of plant galls, with particular reference to the British Isles. A gall is an abnormal growth produced by a plant or other host under the influence of another organism. It involves enlargement and/or proliferation of host cells, and provides both shelter and food or nutrients for the invading organism. (from British Plant Galls by Margaret Redfern and Peter Shirley) Some well-known types of gall are Oak-apples, Robin's Pincushions and Witches' Brooms. Most galls are caused by fungi (particularly rusts and smuts) or invertebrates. Prominent among the latter are aphids, mites, psyllids, gall-midges (Cecidomyiidae), gall-flies (Tephritidae), gall-wasps (Cynipidae) and sawflies, but a wide range of other invertebrates are included. Galls can also be caused by viruses, bacteria and phytoplasmas. Where can I find galls? Almost anywhere that plants grow. Galls can occur on the stems, leaves, flowers, fruits, seeds and roots of plants, and a wide variety of plants are affected, including many very common species. 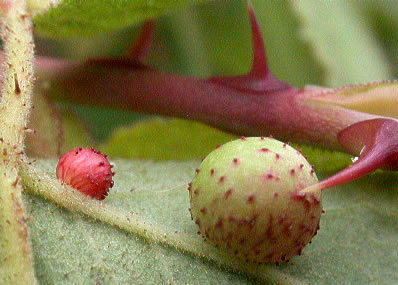 Oaks and willows are particularly rich in galls. How can I identify galls? The book British Plant Galls mentioned above is part of the AIDGAP series produced by the Field Studies Council and contains an excellent introduction to the subject as well as fully illustrated keys to help you identify British galls. In addition, BPGS members can call on our team of experts to help with difficult identifications. See the Verification section for details of this procedure. Where can I send gall records? If you would like to contribute records to the BPGS Gall Recording Scheme, please contact the Records Data Manager . You may like to use the BPGS Recording Sheet which can be downloaded in two parts (front and back) and then printed on either side of a stout sheet of paper or card. There is also a Recording Form (front and back) for use with the Field Studies Council's foldout identification card. Checklist of British Galls 2012 (zipped Excel spreadsheet) This is a new version of the checklist based on the 2011 edition of British Plant Galls. It was created by the book's authors, Margaret Redfern and Peter Shirley.